Health systems in Asia are overly reliant on acute and specialist care while rapidly ageing and complex chronic patients require greater care beyond the hospital. Integrated and predictive care models will help engage patients earlier and more consistently through their healthcare journeys – technology plays a key role. Asia can leapfrog health-system challenges by decisively integrating care, including patients in their care from hospital to home. In Asia, the share of population above 65 years old is rapidly increasing and the region will be home to half of the world’s elderly1 and bear half the global burden of chronic conditions by 2030. Compounding this demandside challenge, growth in working-age population is not keeping pace. In China alone, by 2050, the working-age population will drop by 170 million while the elderly will increase by 190 million2. Today’s already stretched healthcare systems will face increasing constraints in labour supply. Also, patients’ demands as consumers of medicine will change drastically. To expand current care models, Asian nations will need to double or even triple healthcare spend as percentage of GDP just to match OECD spend levels. The scale of such change (in many countries already underway) is massive. Against this forecast, Philips foresees smarter and more efficient care models to avert Asian challenges to sustainable healthcare delivery. Tomorrow’s healthcare should be population-based (weighing cost and outcomes) but individually tailored, thoroughly coordinated around patients.It must also leverage the world’s largest workforce of healthcare workers (today largely untapped): patients and their families. Technology is the fundamental enabler that makes this vision of healthcare possible. Economic growth in Asia is changing lifestyles. Affluence allows greater standards of living, while improving healthcare systems help extend average life spans. In the 1950s, Asia’s life expectancy was less than 45 years whilst today it surpasses 74 years3. With an ever larger percentage of elderly (8 per cent of total population today, 19 per cent by 20504) and growing middle class living sedentary and indulgent lifestyles, increase in chronic diseases is unavoidable. In South East Asia, cardiovascular diseases alone cause over 25 per cent of all deaths. Additionally, there is a shortage of healthcare professionals. One key challenge is that many of the locally trained clinicians are leaving local systems to pursue opportunities abroad and those remaining are usually overworked. Under such pressure, it is neither sufficient nor sustainable to keep building healthcare infrastructure and adding more hospital beds. Rather, health systems must innovate to escape the predictable path of development. Transformative integrated-care models will help maximise impact of existing and future resources. Complex, multi-morbid patients will see more and more specialists. Moreover, general practitioners (family medicine), allied health professionals, such as rehabilitation or physical therapists, plus hospital nursing teams and homevisitation teams, will be involved. Today, each one of these providers operates in their respective care setting, typically independently from each other. Poor coordination leads to repeated doctor visits, prolonged hospital stays, and spiraling healthcare costs. The current payment system does not help either, as it rewards providers for volume of services rendered instead of better patient outcomes. Financial incentives today are not aligned with patient's best interests. The role of patients (and their families) in their own healthcare is usually limited to that of passive recipients of care. Coordinating efforts across the healthcare continuum (with information sharing and efficient care transitions) is not new – it’s been piloted before and is applied today. However, the challenge is to scale-up such efforts aggressively to reach all patients who stand to benefit from tailored cost-effective care integration programs. 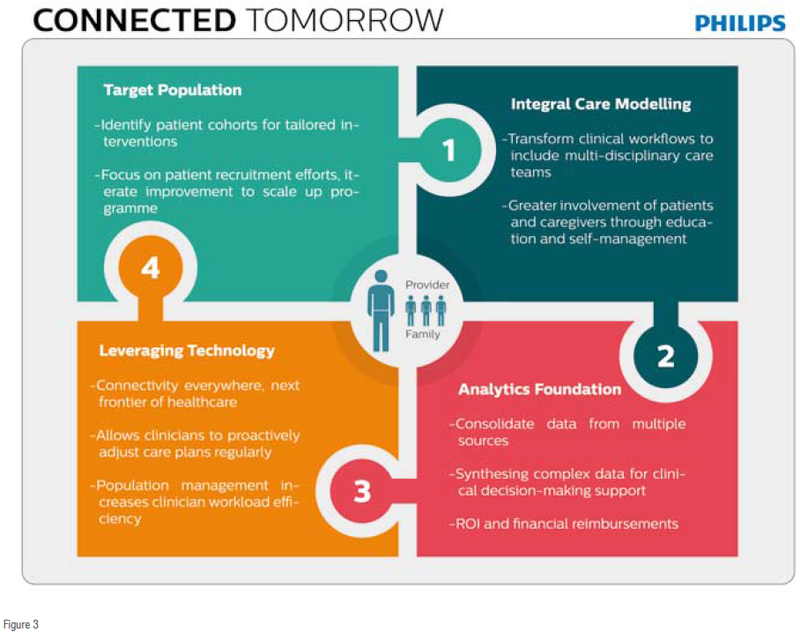 With technology, workflow planning solutions and patient engagement tools, Philips is building the platform to scale-up care coordination efforts from site level (few hundred patients) to national-level (thousands of patients). Ultimately, such collaboration and teaming will not be optional. 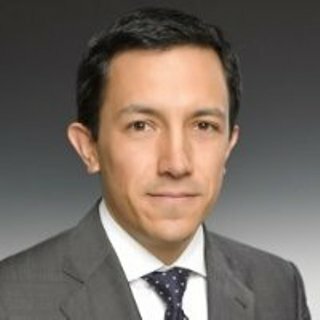 Asia can avoid the pitfalls along the foreseeable path of developed-country systems where improvement in quality and outcomes no longer keeps pace with costs that spiral out of control (leading example is the USA, where annual healthcare spend approximates one-fifth of GDP already5). 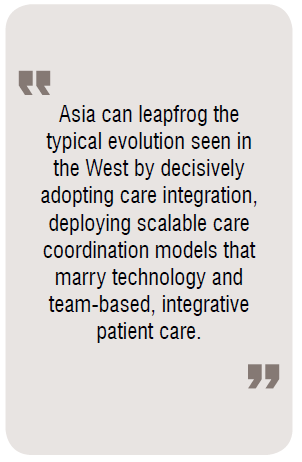 Asia can leapfrog the typical evolution seen in the West by decisively adopting care integration, deploying scalable care coordination models that marry technology and team-based, integrative patient care. Deep understanding and identification of target population cohorts are the first step towards integrated care delivery. There is no one-size-fits-all program. Health systems must understand in detail the population they serve to create tailored clinical programs with differentiated service levels. By leveraging clinical and psychosocial insights, providers can design interventions that fit specific needs. With clearly identified population cohorts health systems can focus on patient recruitment for targeted programs, iterate improvements to scale-up and achieve organizational learning and network effects. Health systems must transform current clinical workflows to include effective multi-disciplinary care teaming. This leverages expertise across health specialties and allows all clinicians involved to practice at the top of their licenses. Health systems must also welcome greater involvement of patients through education and selfmanagement. Putting patients and their families in the cockpit will give them more control of their health status and reduce the need for repeated visits to specialists and eventual re-hospitalisations. With better understanding of their disease and how to best manage it, patients identify signs of imbalance and alert care providers earlier with the right information to allow for timely adjustments. Until recently, using the patient’s home as a prescribed care environment seemed unfeasible. However, technology today can already allow health systems to extend care into patients’ homes with better on-site monitoring and engagement capabilities, making care at home the next frontier of healthcare. Instead of unplanned visits to the doctor, followed by frequent hospital admissions as health worsens, technology is enabling physicians and patients to monitor chronic conditions, including daily symptoms, vital signs and medications, to address care needs proactively. 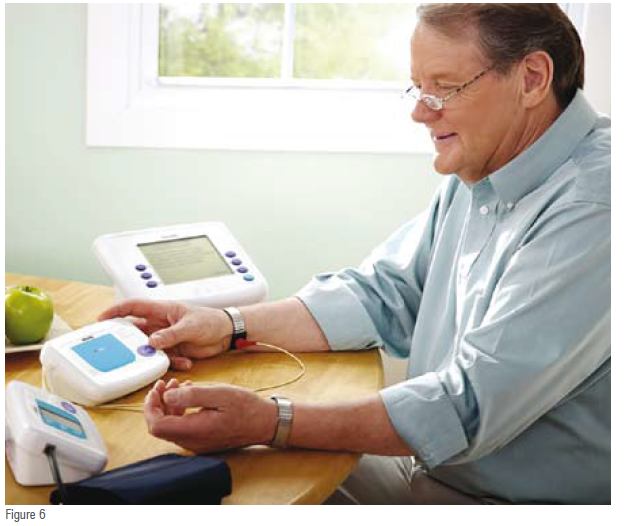 Using connected, intelligent devices, patients will share measurements and feedback on their symptoms directly with their caregivers. 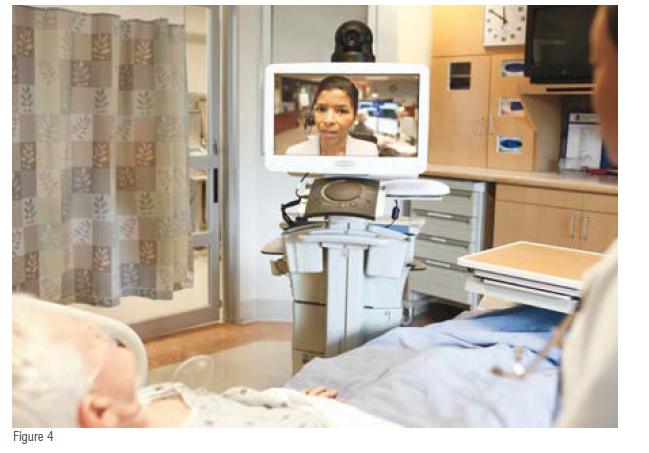 Video conferencing between patients and providers will be commonplace, too. With this in mind, Philips is finding innovative ways to capture objective and subjective data to create a patient’s complete picture of health. 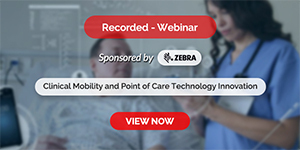 Leveraging this information, connected care teams spot complications early and adjust care plans accordingly, effectively preventing hospital readmissions or emergency room visits. Patient portals provide recorded discharge instructions, keep patients engaged with health surveys and educational content, enable video communication with doctors, and remind patients of upcoming appointments to help keep them on track. Connected and integrated care requires healthcare data to flow through the system. Providers will have additional decisionmaking support (right decisions at the right time), by combining healthcare data from multiple, decentralized sources with help of advanced analytics - algorithms capable of synthesizing complex data sets. Influx of data will otherwise overwhelm care providers: data needs to be translated into clinical utilities and decisionmaking tools that enable accurate, timely interventions for all members of the care team. 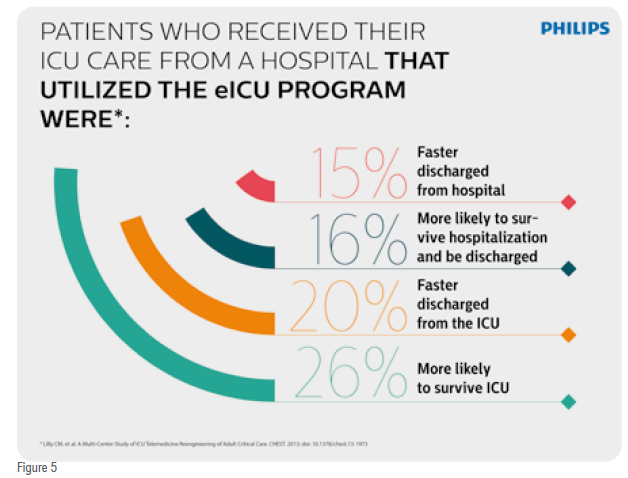 The connected care model is most dramatically demonstrated in the most acute of care settings: the Intensive Care Unit (ICU) and high-dependency units (HDUs). ICU patients need continuous monitoring to manage their delicate conditions as changes happen rapidly and unexpectedly. Clinicians are on alert. Yet, intensivists, who oversee care, are often on-call and during off-hours are not readily available at bedside. If something goes awry with a patient, bedside team members will attempt to reach intensivists by phone to request directions on imminent care decisions. • Intensivists immediate availability determines how clinical knowledge is applied to interpret subtle – but significant – changes to a patient’scondition. 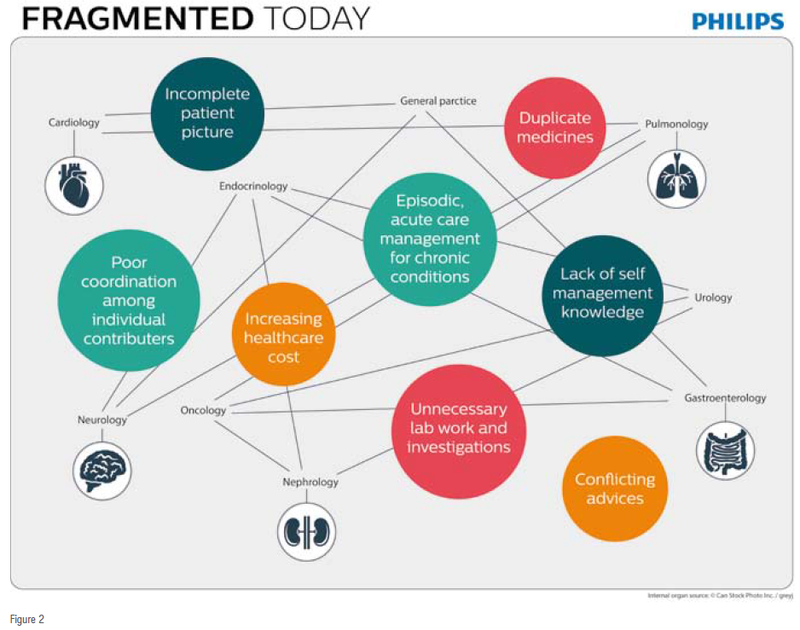 Philips developed TeleHealthenabled connected care models to prevent adverse events instead of responding to them. By establishing a real-time, connected hub for virtual care, health systems can leverage experienced intensivists to oversee patient care anytime, anywhere. 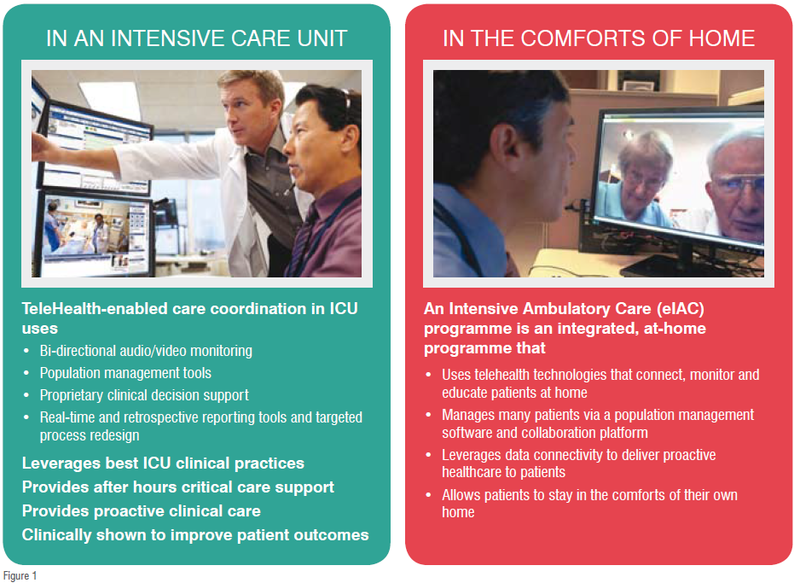 Using bedside video monitoring and clinically relevant information fed into the eICUhub, one intensivist and a small team of nurses oversee intensive care for up to 100 patients regardless of their physical location. Such coordinated care team uses analytics to monitor changes in overall conditions that impact care decisions. These results point to a significant opportunity in Asia to improve patient outcomes and reduce costs, especially as health systems in the region rely heavily on acute care. Beyond ICU, a comparable study of an acute care (HDUs) TeleHealth programme showed reduction in patient’s length of-stay by 17 per cent, and reduction in death or discharge to hospice care by 26 per cent. Effective chronic care management must engage patients at home, beyond the controlled confines of traditional, institutional care settings. Philips partnered with a large healthcare system in the US to develop an integrated, at-home telemedicine eIAC (Intensive Ambulatory Care) programme that identifies hundreds of patients most at risk of future high-frequency readmissions. Unlike traditional diseasespecific telemonitoring programmes, many of these patients have multiple chronic conditions that are difficult and expensive to manage – not to mention damaging to patients’ quality of life. The healthcare system put together a dedicated and coordinated multi-disciplinary care team of primary care physicians, nurses, social workers, pharmacists and health coaches to coordinate various aspects of care for this group of patients within their own homes. Patients in this programme receive various devices with patient engagement apps and video call capability to engage them into participating in their own healthcare, within the comfort of their home.Through this new model, the care team identifies early stages of deterioration through a mix of real-time monitoring data, and when necessary, intervene and adjust care plans to prevent adverse events and hospital visits. Throughout Asia, healthcare providers should accelerate coupling of technology and coordinated, proactive patient care in anticipation of inevitable shifts in care needs from populations with long-term chronic diseases, clinician shortage and the rising cost of care. These challenges require a new approach to delivering patient care. With technology-enabled care coordination programs providers can maximise impact of clinical resources and engage patients to proactively manage their care. Doing so at scale will improve quality and cost across the continuum, from institutional care all the way to the home. Fernando is head of Philips Hospital to Home business for Asia Pacific. He believes deeply in moving care to the Home, helping people play bigger roles in managing their own health. His career includes strategy, marketing, commercial leadership roles across Philips Corporate, Consumer Lifestyle and Healthcare in Middle East & Africa, Asia. Before Philips, he was a management consultant with A.T. Kearney in Europe.